When I was 20 years old I decided to go west to America. By that time I had already produced a few ”serious” wildlife documentaries that had been purchased by Swedish Television. In America I found the inspiration, that injection I needed. I fell in love, not with a girl (she came later), but with an incredible wilderness. The first exquisite infatuation occurred early one morning in northern Arizona after a few months of crossing the American continent. In the middle of the night I had parked my Volkswagen camper van in a quiet spot a little ways from the road. The roof of the van was raised to create a tent with openings in both directions. After driving over 600 miles, I was exhausted and not picky about the parking spot. Sleep came as a welcome relief when I had crawled into the bed under the raised roof. I was awakened in the morning when the sun’s rays shown into the tent. Slowly opening my eyes, I gazed, somewhat confused, at the scene outside the screened windows. At first I couldn’t really grasp what I was looking at; it was so indescribably breathtaking. Suddenly I was wide-awake. During the night I had parked right on the edge of the Grand Canyon. All that kept the van from rolling into the abyss was a few rocks sporadically placed along the edge. The ragged and steep ravine was filled with rock formations of various colors with shadows dancing in the morning light. The canyon spread before as the eye could see. Describing this jewel of creation with words is futile, inadequate, humbling. 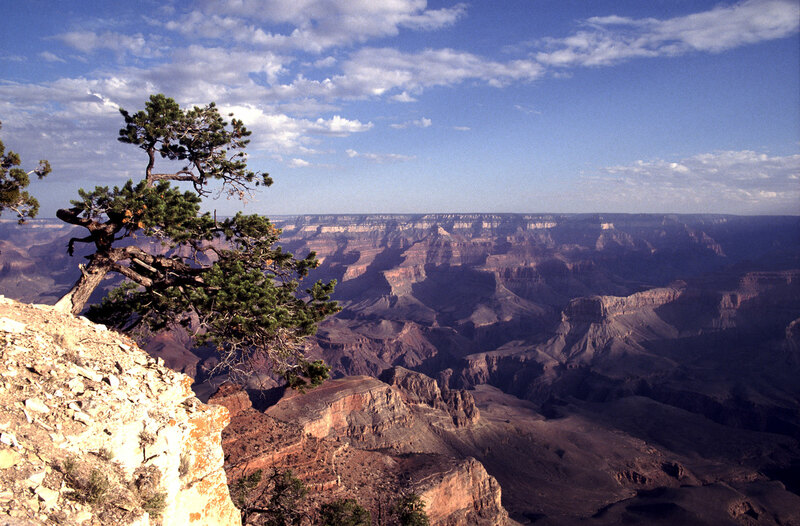 The Grand Canyon has to be experienced first hand. After hiking along the edge that first day, trying to absorb what I saw, I couldn’t wait to descend into the gorge. Early the next morning I was on my way down the Bright Angel Trail. I was so excited that I forgot my water and food in the car. Six miles later gazing out over the Colorado River and with temperatures over 100 degrees, I realized my mistake. I spent the next few days exploring the south side of the canyon, hiking and climbing in the most impossible areas. I decided that I would return the next year and begin work on my first film about the Grand Canyon and the area around the Colorado River. In 1979 I returned and produced a film called “Grand Canyon” that Swedish Television purchased and aired the following year. I was already dreaming of rafting the Colorado River through the captivating landscape of which the Grand Canyon National Park is just a part. That dream was realized 12 years later.